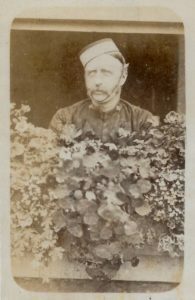 Thomas Bradney Shaw-Hellier was born on 2 Oct 1836 and was effectively the last of the Shaw-Hellier line when he died in Italy on 23 Dec 1910. 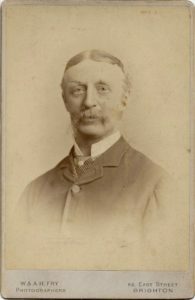 He was the only son of Thomas Shaw-Hellier, latterly of Rodbaston Hall. Thomas was educated at Winchester and Brasenose College, Oxford. He joined the 4th Royal Irish Dragoon Guards in about 1863 rising to Captain 1867, Major 1876, and Lieutenant-Colonel commanding 1882. He saw active service in Egypt in 1882. 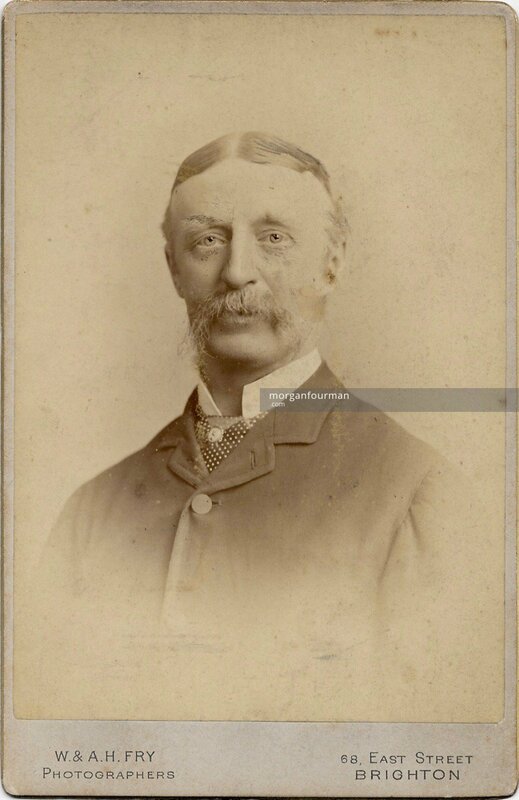 He finally attained the rank of Colonel and became Commandant of the Royal Military School of Music, Kneller Hall in 1888. He retired in 1893. 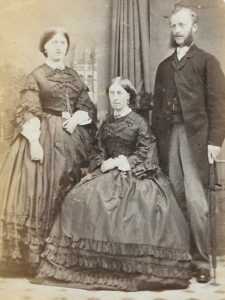 When Thomas did eventually marry in 1899 it was to his distant cousin Harriet Sophia Bradney Marsh (Evans) – culminating the long relationship between the Hellier and Evans families and bringing adjoining estates together. 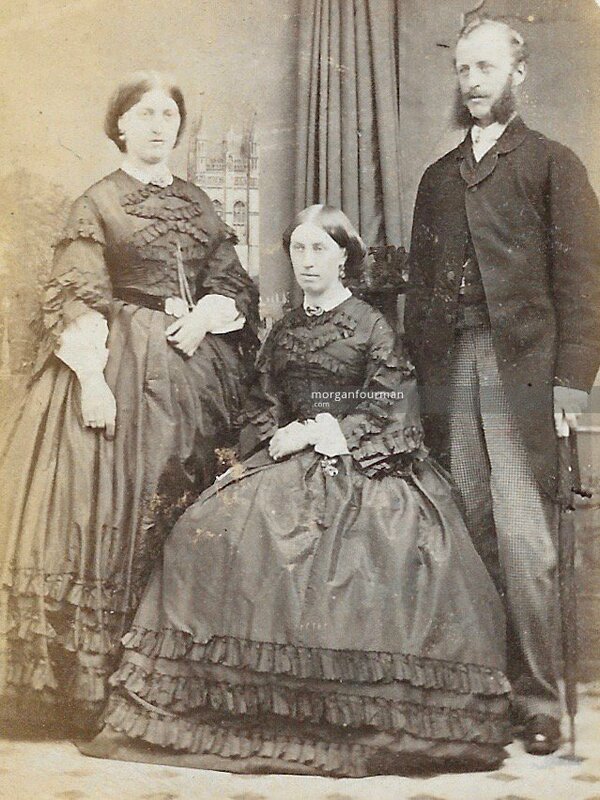 Harriet was the only daughter of Rev John (Bradney Marsh) Evans of the Lloyd and granddaughter of Charles Evans. The marriage in theory brought several lines and estates of important eighteenth century Staffordshire gentry families together- the Bradneys, the Pershouses, the Marshs, the Helliers etc. But the couple were both ‘elderly’ and there were to be no children. This marriage was described in a letter from Aunt Og as an “unsuitable match”. By 1905 the Shaw-Hellier estates were designated to pass to the heir and the children of Thomas’s deceased sister, Evelina – the Simpsons. In the family tradition the Simpsons changed their name to Shaw-Hellier but Thomas’s great nephew Arthur Bradney Shaw-Hellier was killed at Gallipoli. Arthur’s two spinster sisters lived at the Wodehouse until the death of Dorothy Shaw-Hellier in 1981. Thomas Bradney Shaw-Hellier was known to Molly Evans as Uncle Brad and we have a number of photos of him. Some of this revolves around the Wolverhampton Volunteers that he and the Evans family seems to have been involved in, in the 1860’s. He was the best man at the wedding of Henry Evans and Florence Marten in 1889. Henry Evans was his first cousin. He was also godfather to Molly their eldest daughter. He seems to have retired to a villa in Taormina Sicily in about 1907 where we have an account of Jean Evans (nee Playfair Gow-Gregor) who visited him and his lady friend there. The Villa San Giorgio that he built there was designed by CR Ashbee, the Arts and Crafts designer, who was also responsible for architectural work back at the Wodehouse, Wombourne. Taormina clearly allowed a retired military gentleman a great range of social freedom that he could not have enjoyed in England. It was renowned for its plentiful supplies of young boys something that Ashbee, a homosexual, was evidently attracted by. We can only guess, given his long years of bachelorhood, that it also suited Uncle Brad. Thomas Bradney Shaw Hellier died out in Sicily on 23 Dec 1910. His will is a few lines long and states that everything is left to his nephew Evelyn Simpson. Memoir written by Eric Benton (husband of Grace Agard Evans) recalling the visit of Jean Playfair Evans (wife of Ernest Agard Evans) recounted in “The Descendants of Annie O’Brien” compiled by Rex Evans, Evagean Publishing, NZ. This describes a visit to the Wodehouse in the 1930’s and ‘calling on’ the two Shaw-Hellier sisters there. It also recalls Jean’s earlier visit to Taormina in about 1909. © 2019 Morgan Web Site. All Rights Reserved.